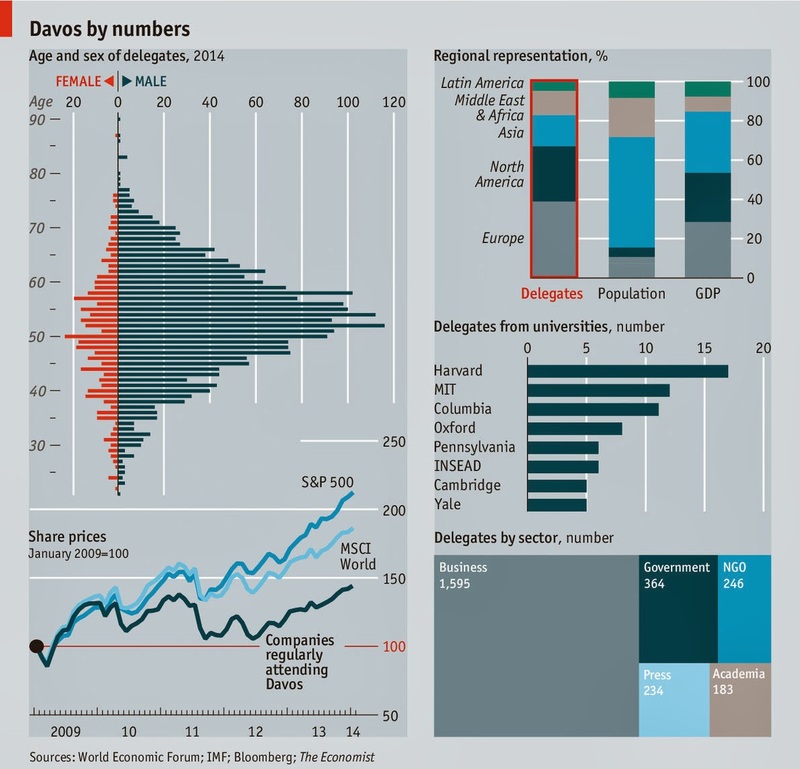 Acts of Leadership: Davos by Numbers or "Who's on magic mountain"
Davos by Numbers or "Who's on magic mountain"
The Economist goes on to say that "Two-thirds of the delegates hail from Western countries that are home to just 12% of the world's population". Hardly representative, then. Nor are people younger than 30 well represented, especially when you consider that 42 or 43 of the world's population is under 30 years of age. Universities are also clustered, rather than represented, as quite a chunk are American institutions and that Harvard is the top attender. The Economist also notes that "60% ​​[of attendees] are businessfolk and 14% come from government. The 46 presidents and prime ministers represent 1.8 billion of the world's 7.1 billion people." Surprisingly, a lot are journalists: about 9%: "One in eleven is a hack - four from The Economist." Davos is a smorgasbord of money, too. "The total worth of the 15 richest is around $ 285 billion. The stockmarket value of firms represented is $ 12 trillion, about one-fifth of the world's total. And after all the inflated expenses and egos, what has been the fate of the companies that sent delegates at least three times in the past five years? Those 104 firms underperformed both the S & P 500 and MSCI World Index." (The Economist, 24 January 2014).